Anyone up for a friendly chat. Well... I found my cat in my sock drawer earlier.. I went to pour myself a drink at it's page 4 already! I hope it's not too late to join in! Good night. I hope you get a great night sleep. 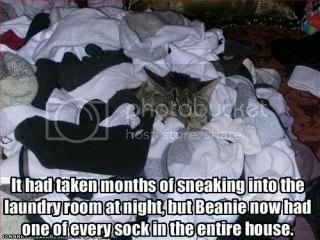 Um well now you know who steals your odd socks. It must be stealing mine too then! Im trying to tale a pic of her but its too dark and shes black and white! Nooo!! I just gave my daughter panadol to stop her getting up every 5 minutes telling me that some other part of her body hurts and just go the F to sleep - can't you see mummy is busy procrastnating! Id love to join in, but I'm fighting to stay awake! I have just finished making Scones, chocolate cake, caramel tarts and 3 lots of jelly. My poor feet hurt! All times are Australian EST. The time now is 12:36.